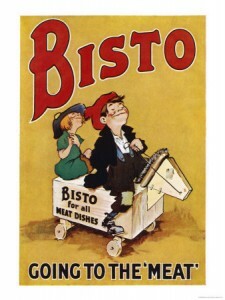 In 1919, the Bisto Kids (created by illustrator Will Owen (1869–1957)), appeared in newspapers and soon became popular. Bisto is notable both for the age of its brand and for the advertising campaigns it has used. Although the Bisto Kids have not been included in Bisto advertising for many years, many people still recognise them; the Bisto Kids, a boy and girl in ragged clothes, would catch the odour of Bisto on the breeze and exhale longingly, “Aah, Bisto!” This clever gambit was intended to capture the all-important “Oliver Twist” (or “urchin”) segment of the working-class market. The Bisto Kids were also part of more elaborate advertising campaigns in later years.